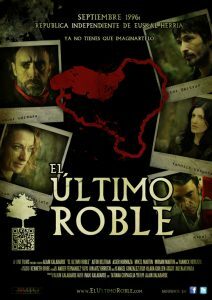 ‘El Ultimo Roble’ tells the story of various characters involved in a parallel history where the Basque Country becomes an independent country during 1996. A fateful coup d’etat, an intriguing political conspiracy and the imminent arrival of a civil war for the conquest of the remaining Basque provinces are only a few of the events that will keep you on the edge of your seat. The film currently enjoys a growing following of 2500 fans on Facebook and has been featured in newspapers, radio and television.